Why should you learn to massage your baby? Touch is the simplest form of communication. Touch is the only sense that infants cannot survive without. 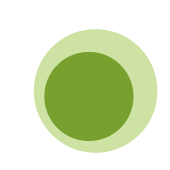 A child can lose his/her hearing sight or taste, and still survive. But without touch, he/she will die. Limited or lack of touch early in life leads to delays in sensory, motor and cognitive processes. This is the reason why it is so instinctual for parents to love and hold their child, its survival. There are 4 different classes that you can choose from, my recommendation is that you take the basic baby massage class first to help you learn the basic techniques as the other 3 classes have more advanced techniques that will be much easier to learn and understand if you already have a basic understanding of how to do infant massage. This class will help promote relaxation, encourage a deeper bond between you and your baby, as well as to give your baby a better sense of bodily awareness. This class targets your baby’s belly. Regular tummy massage can help reduce the frequency & intensity of gas and constipation or avoid it all together. This class will teach you a specific massage sequence that you can incorporate into your baby’s bedtime routine. Each class will be roughly 1.5 hrs from the time you walk in to the time you walk out and will be held no earlier than 11am. You will leave with a bottle of oil containing an essential oil that is specific for each class, a handout with the massage strokes and information and the know-how to massage your baby safely and effectively! 1. Stimulation of the Nervous system, respiratory system, circulatory system, immune system and digestive system. 2. Relief of gas, constipation, teething, congestion, emotional stress. 3. Interaction and development: Massage can help increasing bonding between any parent of caregiver and the child. 4. Relaxation: The most obvious reason for getting a massage not matter what your age is. Studies are being conducted that are indicating that cortisol levels in babies who are massaged on a regular basis, with a consistent massage pattern, are lower than babies who are not massaged. As well, the positive hormones like dopamine and serotonin increase. There have also been studies showing the mothers hormones are positively affected by massaging her baby. These include increased levels of the LOVE hormones oxytocin and prolactin. This, in turn, will have an influence on her feelings of success as a mother, breastfeeding and post-partum depression. 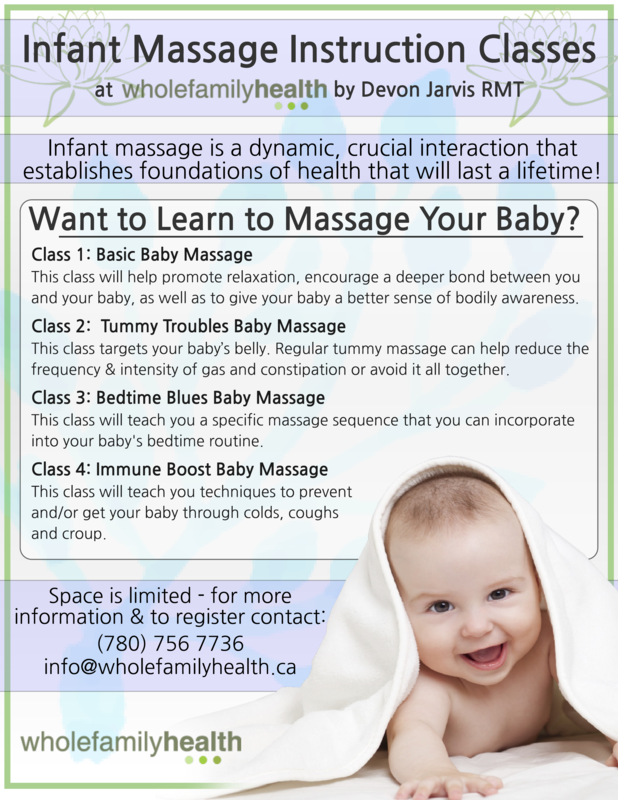 Are you interested in learning how to massage your baby?! Register for one of the classes TODAY! SPACE IS LIMITED – contact us at 780 756 7736 or info@wholefamilyhealth.ca to register!